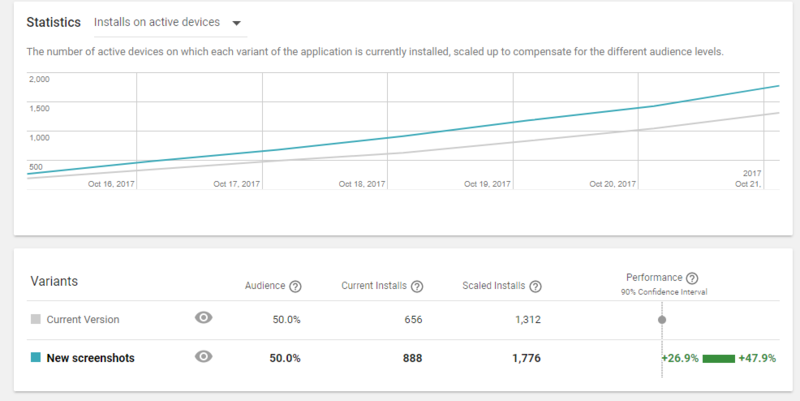 Google Play's Experiments engine is hands down one of the most powerful and useful tools in the belt of an ASO (who has only an Android app, or both an Android and iOS app). Yet, running Google Play's A/B tests can also be a very frustrating experience when your test results show a winner, but actual results don't show any tangible improvement. This post is a collation of the top 5 tips from team Incipia for running A/B tests, plus additional advice from ASO expert at 8fit, Thomas Petit. 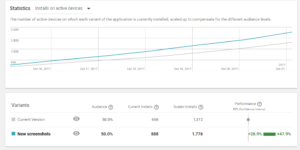 For a more in-depth breakdown of how to run successful CRO efforts, check out our Advanced ASO book (Chapter 6: Increasing Conversion). As pointed out in Thomas's slideshare, a 90% confidence interval is actually not extremely confident and can lead to wild swings in test results, or tests that don't produce real gains. Knowing this should encourage you not to apply any tests which do not have a high lower limit expected outcome. Internally, we like to pursue tests that are at least 5-10% on the lower limit (and which also follow the other best practices below). It's important to realize that the confidence interval Google displays is extrapolated from the current installs of each test variant. 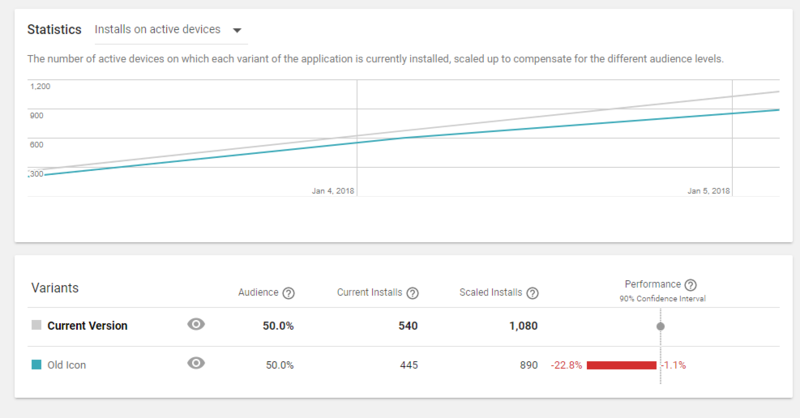 This means that if your app has a low amount of traffic flowing to each test, the real difference in performance between variants may be very small (as small as a few installs), and thus the extrapolation of that data more susceptible to a wide margin of error. In other words: your test may show a result that you may not realize by applying the result. Apply tests that are not declared a winner at your own peril. While as mentioned above a 90% confidence interval is not the best, it is still based on methods of calculating statistically significant data, and is most likely better than deciding yourself whether or not the performance is good enough. If a test has not yet been declared a winner, there's a good chance that your results will be nominal gains, or even negative. Run tests that gather at least 3-7 days of data, or earn a good number of current installs (1,000+) per variant. A/B tests can be subject to sampling bias, especially if you are running the full 3 unique variants and if your install volume is low. While Google should be selecting users at random for each test, it's still possible that users from keywords or other sources that convert naturally higher or lower may be sent to one variant; this means that the variant's performance will be skewed higher or lower, by no means of the variant's performance itself. Because of this, you should also not apply tests that show a winner after <3 days. Run fewer variants simultaneously or turn up your UA efforts for faster results. Watch tests over time to see whether the performance trend is consistent. Seeing a variant that "holds the lead" for several days straight can be an indicator that the results are consistent across multiple different groups of randomly selected users, which is a good sign. Another tip from Thomas is to run a "B/A test," which can confirm whether the results of your test are consistent once fully applied. The "B" means to set the variant from the prior test which produced good results as the "A" (or control) of the next test. This helps you determine, from two separate tests, whether the same variant was select as the winner in each. You may be surprised at how many B/A tests fail to select the same variant. If this is the case, your best bet may be to continue testing new variants. In addition to or in place of running a B/A test, you should also measure the results of a test after applying it, by comparing your conversion rate in the period before the test was run to the period afterward. Be sure to measure results from the specific country that you ran the test in, and also be sure to measure the conversion rate before the test began; this is because the test could have affected your conversion rate while running. Usually 1 week is a good preliminary period of time, but several weeks will help you understand the trends better than 1 week. Be aware that user acquisition data will not be fully updated for days or even weeks after the original date. Going against the logic of running tests for a longer period of time is the idea of ending tests which produce significant negative results for 3 consecutive days (or even 2, but not a single day), even if a winner is not yet declared. 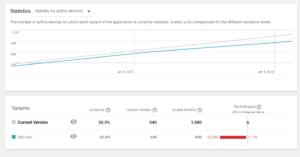 This is because A/B testing has repercussions on your app's real performance, meaning that poor variants will have a real, negative impact on your app's overall ASO health, which is the opposite of the goal of A/B testing. While it is possible, it is very unlikely that a test which has a big, negative performance trend will recover and outperform to a big degree, especially if your test has high traffic and fewer variants.